The situation in the ATO zone has been relatively stable during the last 24 hours. Shellings by Russian-terrorist forces were observed in Artemivsk and Luhansk areas (only small arms were used). Russian-terrorist forces continue regrouping their forces, transferring material and supplies to deployment sites, and equipping [combat] positions. In addition, enemy sabotage and reconnaissance groups are active in their attempts to identify the ATO forces’ defensive positions. Over the past 24 hours, the enemy moved a self-propelled battery of 2S1 “Gvozdika” howitzers (five units), and a mobile reconnaissance and command unit mounted on a lengthened MT-LB chassis towards the settlement of Snizhne. An armored group (eight armored combat vehicles, including BMP-1 IFV and two MT-LB) arrived in Lutuhyne. Reinforcements (120 personnel) reported to the so-called Motorized Infantry Brigade of the “1st Army Corps” (of the “DNR” [Donetsk People’s Republic]) stationed in Horlivka. In Donetsk, the security of the administrative buildings that house the so-called “state authorities” of the “DNR” terrorist organization has been dramatically tightened. A militant infantry unit (up to a company in strength) arrived to join the gang operating in the area of Krasnohorivka and Mar’inka. An accumulation of civilian vehicles with armed men in military uniforms has been observed in borderland areas, namely near the “Dolzhanskyi” checkpoint and the settlement of Amvrosiivka. The movement of a militant mortar battery (2B9 mortars “Vasilek”) has been observed in the vicinity of Sakhanka. 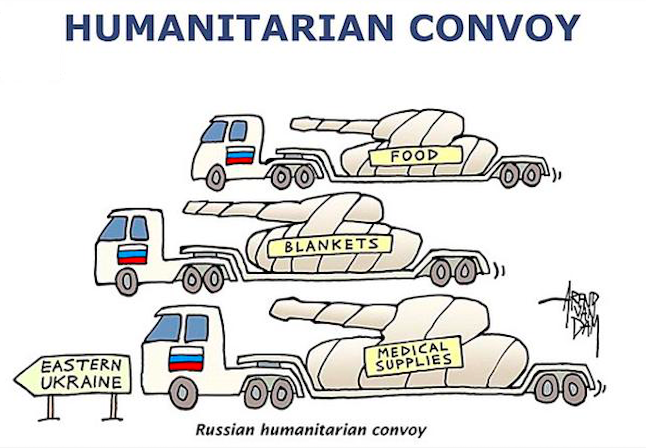 The 38th Russian “humanitarian convoy” with 44 vehicles arrived in Donbas on Sept. 17th. Source. This entry was posted in Dmitry Tymchuk, English, English News, Pictures, South&Eastern Ukraine, War in Donbas and tagged #FreeAfanasyev, #FreeKarpyuk, #FreeKlykh, #freekohver, #FreeKolchenko, #FreeKostenko, #FreeLitvinov, #FreeSavchenko, #freesentsov, #Information_Resistance, #RussiaInvadedUkraine, #StopRussianAggression, #UkraineUnderAttack, ‪#‎FreeDegermendzhy, ‬ ‪#‎FreeChiygoz, Dmitry Tymchuk, Donbas. Bookmark the permalink.